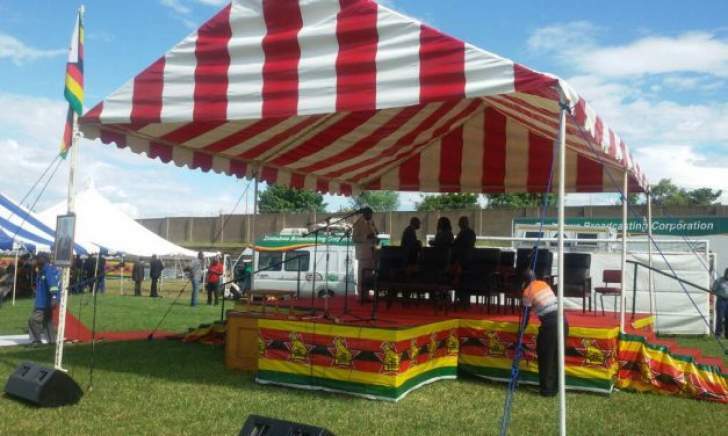 President Emmerson Mnangagwa will today address a Zanu-PF rally at Nyamhunga stadium in Kariba after commissioning the Kariba South Hydro Power Station Expansion Project. This brings to an end our official proceedings here at Nyamhunga Stadium in Kariba. Thank you for joining us! 17:25 - The Special Advisor to the President Christopher Mutsvangwa is now giving a vote of thanks. 17:22 - "Let us unite and love one another for the development of our country," says Mnangagwa. 17:20 - He says the country has exceeded $7 billion commitment in terms of investment. 17:17 - Mnangagwa says the government has put in place programmes to ensure that the country is food self sufficient. 17:16 - "We must not live in the past, the past is gone and people should live in the present. That is the motto," says the President. 17:15 - He says he is confident Zanu-PF will win resoundingly in the forthcoming elections. "The increasing number of political parties shows that Zimbabwe is democratic. Vose vane havi yekuformer tumapato twenyu fomayi tigonyatsokurakashai muna July muzive kuti Zanu-PF inorakasha, ichingorakasha, ichingorakasha …ichingotonga ichingotonga ichingotonga Zanu-PF," says the President. 17:14 - President Mnangagwa says he had planned to meet the other political parties in the country to outline the election roadmap but had to postpone due to the ever increasing number of the parties. 17:13 - He says the new government which came into office in December was the plan of God and the political transition was done peacefully and smoothly. 17:12 - The President reiterated that elections will be held in July this year. 17:11 - Mnangagwa urges the people of Zimbabwe to remain peaceful especially in the wake of visitors. 17:10 - He reaffirms that Zimbabwe is open for business adding that during the closure of the Africa CEO Forum the country received pledges worth $1.5 billion worth of investments. 17:09 - President Mnangagwa narrates his trip to the Africa CEO Forum held in Cote d'Ivoire this week. 17:07 - He urged the people to work towards the economic development of the country. 17:06 - President Mnangagwa is now giving his address. 16:57 - Vice President Chiwenga takes to the podium and he chronicles the history of President Mnangagwa since time immemorial. 16:54 - Muchinguri-Kashiri is now on the podium and she introduces the two Vice Presidents to the people of Kariba gathered for the Zanu-PF meet the people rally here at Nyamhunga Stadium. 16:53 - Zanu-PF Mashonaland West provincial chairman Ziyambi Ziyambi takes to the podium and invites the party's National Chairperson Oppah Muchinguri-Kashiri. 16:49 - Official proceedings here commence by the singing of the national anthem, "Simudzai mureza weZimbabwe….."
16:44 - President Emmerson Mnangagwa, his two Vice Presidents Kembo Mohadi and Rtd General Constantino Chiwenga, government ministers and the Zanu-PF party's top officials arrives here at Nyamhunga stadium.